This turkey veggie tray is an easy and fun platter to bring to any Thanksgiving or Friendsgiving party. 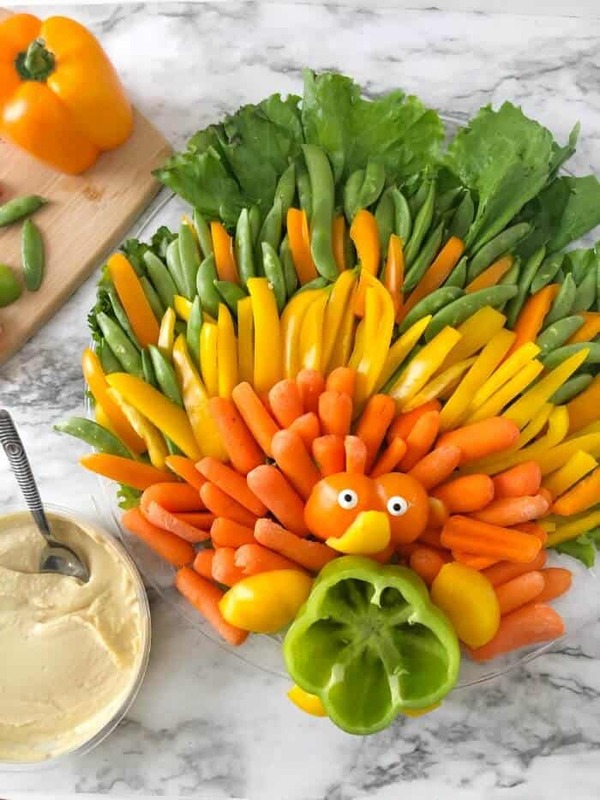 The kids will love this fun turkey and you’ll have all your appetizer snacking ready to go as your Thanksgiving day feast cooks. This turkey vegetable platter is perfect for a crowd, especially if you have guests who are vegetarian, vegan or have food allergies. We made this fun turkey platter for a crowd, and the kids and adults both really loved it. Friendsgiving is something that’s happened in our house for a long time. Our family has moved multiple times across thousands of miles, which means that when it comes to the holidays you’re not always to be with your family. Our table has often had a misfit crowd of friends (and even sometimes acquaintances!) gathering together. When my husband was in graduate school, our table many Thanksgiving was a missmatched crowd of budding scientists who couldn’t travel home and friends I had made that otherwise would have been eating off the Whole Food’s hot bar while binge-watching Netflix. I’ve learned I like to do a couple of extra friendsgiving food ideas for the holiday because I’m a firm believer that it doesn’t take much to make a holiday feel special. This turkey veggie tray is one way to liven up the party with a few extra smiles. Now we live a little closer to family than we ever have, and are blessed to spend more time with them but we find we are still celebrating Friendsgiving (or sometimes we call it Thanksmas and celebrate both holidays) before or after the actual holiday. It’s a great excuse for everyone to get together, let the kids play like crazy, and connect over a feast! Anytime you bring a bunch of people together who are different from each other, you’ll find you want to have variety. This fun turkey veggie platter is a crowd pleaser. 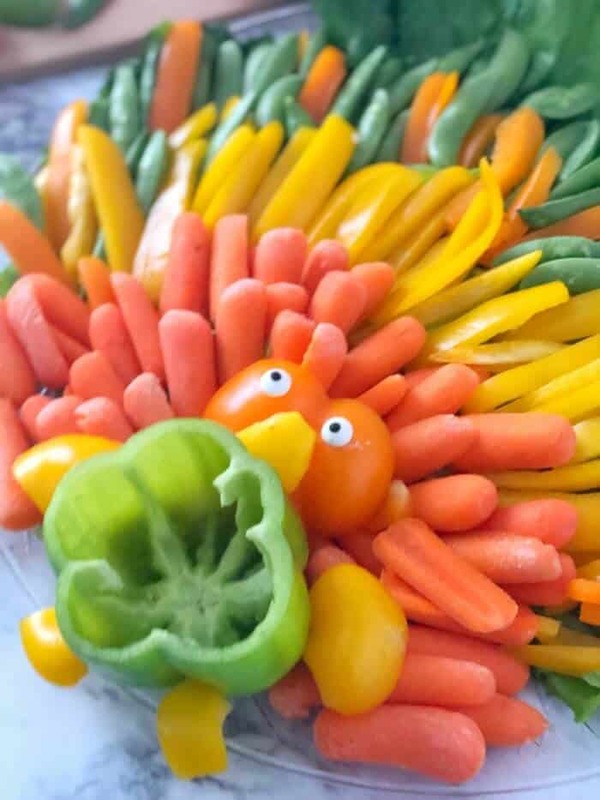 Expect a few giggles and smiles, this Thanksgiving turkey vegetable tray is totally worth spending a few extra minutes on your veggie platter. 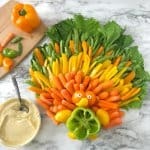 What Kinds Of Thanksgiving Dips Could I Put With This Turkey Veggie Platter? I have found with a vegetable platter, cold dips are usually the way to go. I filled my dip holder full of storebought hummus this time. You could make your own hummus (I like this hummus recipe from Cookie and Kate, it’s always super creamy!) Other ideas of great dips for this turkey veggie platter include dill dip, ranch, white bean dip, my sunshine carrot dip, or guacamole! The dip you pick totally depends on your crowd! 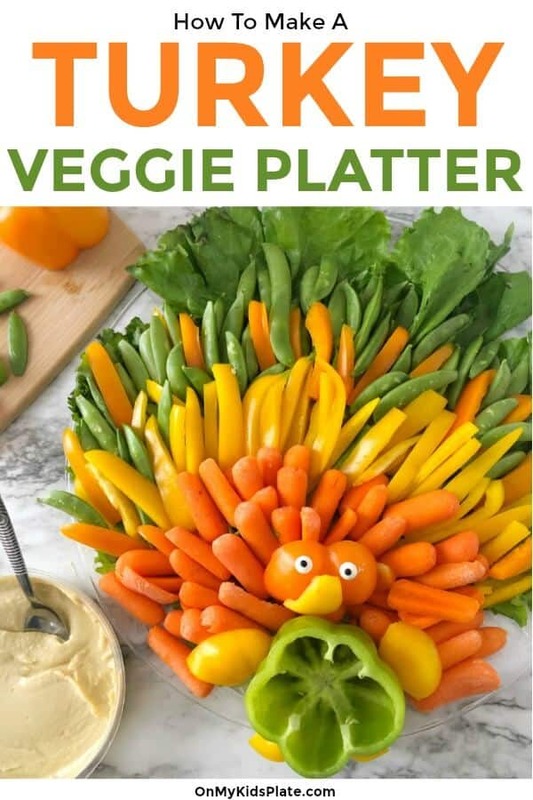 How Do I Make The Turkey Face On This Veggie Platter? The turkey face on this platter is all on the bell pepper. Slice the bottom off one of your bell peppers. Now slice that piece so that you have two pepper bumps connected, this becomes the orange face. Slice the top off of a yellow bell pepper and peel away the stem and seeds. Slice one yellow pepper bump into your beak, attaching with half of a toothpick to stabilize. Use the other bumps from the top and bottom of the yellow pepper to make the wings and feet, attaching with more toothpicks broken in half if necessary. Attach the candy eyes using a bit of hummus or honey as glue. Can You Prep Veg The Night Before? You can make this tray the night before, but I wouldn’t prepare it much more in advance then a day or two or your veggies run the risk of being not crisp. To make things go faster the day of, rinse and precut your veggies. Alternatively, you can use storebought precut veggies to save time for making your platter. How Do You Keep This Veggie Tray Fresh? All of the veggies on this platter can be served raw without a problem. You can wrap them in a damp paper towel to help keep them fresh and crisp. You can place damp paper towels over this platter the night before to keep the veggies on this platter looking fresher. This turkey veggie tray is the perfect party tray to bring to your Thanksgiving or Friendsgiving celebration! 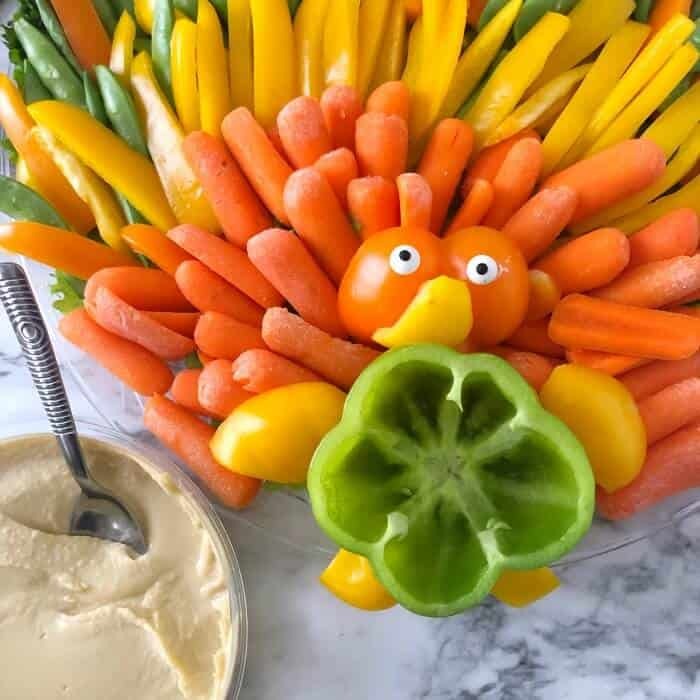 Full of fun and crunchy vegetables, kids and adults too will love this fun turkey plater with dip! 15-16 ounces Sugar Snap Peas You want the bigger bag! Start by washing all your veggies and drying them well. Place large lettuce leaves across the platter as the base, with the stems all pointed to the middle and bottom of the tray where the turkey will be. Slice the top off the green bell pepper. Clean out the seeds and place it on the tray. You'll want to adjust all of the veggies based on your pepper you are using for dip. Alternatively, you can use a small bowl for the dip. Slice the bottom bumps off one of your orange bell peppers, and slice that piece so that you have two pepper bumps connected. This becomes the orange face. Slice the top off of a yellow bell pepper and peel away the stem and seeds. Slice one yellow pepper bump into your beak. Use the other bumps from the top and bottom of the yellow pepper to make the wings and feet. Now set the face, wings, and feet to the side. Now add your turkey's face, wings and feet. Break toothpicks in half and use them to stabilize pieces as necessary. Attach the candy eyes using a bit of hummus or honey as the "glue." If you are traveling to someone's house with your platter I recommend doing this step after you arrive at the party with the hummus you are bringing. Add hummus to your pepper just before the party, and enjoy the smiles over your adorable veggie turkey platter. I used a big clear platter I got at Dollar Tree that was 14 inches across to make this turkey veggie tray. You may need to adjust your veggie amounts depending on the size of your tray. Have you ever made something fun for Thanksgiving like this turkey veggie platter? What other veggies would you swap out for your family or friends? I’d love to know about if you make this down in the comments.